Hosley's Set of 2 Resin Pillar Holder- 14" High. Ideal for LED and Pillar Candles, Gifts for Wedding, Party, Home, Spa, Reiki, Aromatherapy, Votive Candle Gardens. Large holder measures 4.92" x 2.76" x 14.00" Small holder measures 4.12" x 3.94" x 12". For use with 3" x 3" pillar candles only. Candles not included. PRODUCT: Hosley's Set of 2 Resin Pillar Holder- 14" High. BENEFITS: Great for the remembrance of the special occasion. It's perfect if you are looking for decorative accent. When using in your home as a decorative accent. For use with 3" x 3" pillar candles. MEASUREMENTS/MATERIAL: Each one measures: small 4.12" x 3.94" x 12" and large 4.92" x 2.76" x 14.00" , and made of resin. 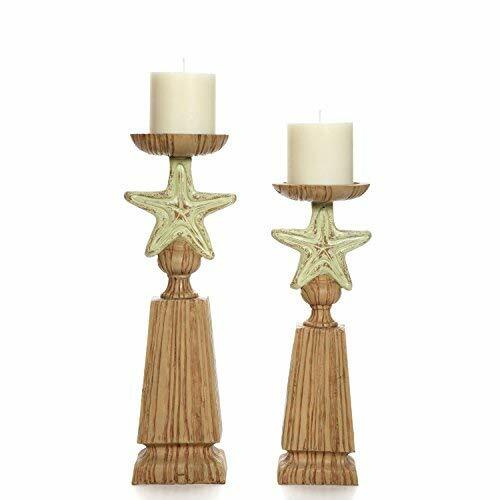 CYS Brand Hurricane Candle Holder, H-16"